This week’s Adventure of the Week comes from Aaron Gaines, founder of North Tahoe volunteer group The Gang and Porters softball team player. 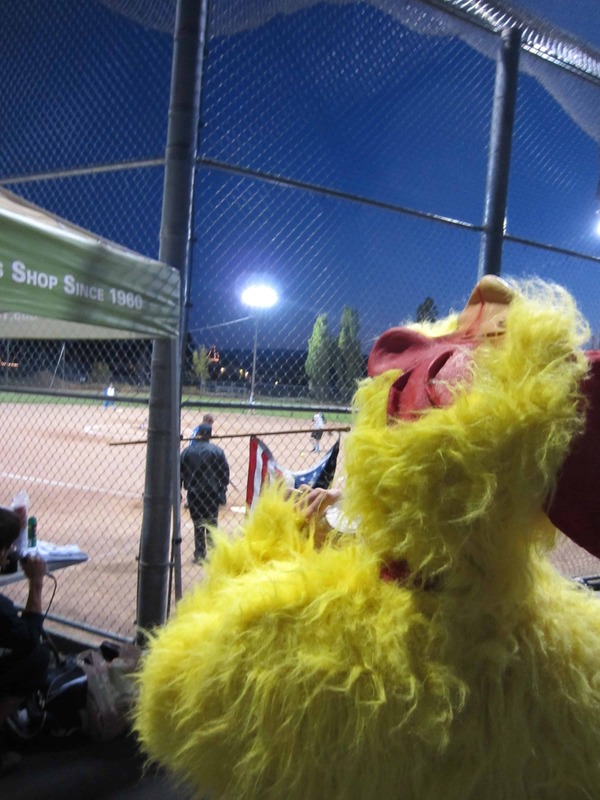 If you haven’t been out to a Tahoe City D League softball game, you need to make it happen next season. It’s crazy out there!! 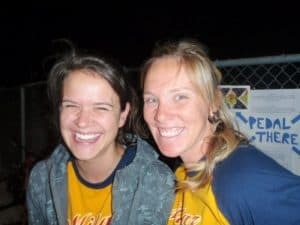 All of the best elements of small-town Tahoe life were on display on a recent Thursday in Tahoe City, where a large group of friends gathered for an evening of softball, bbq, and fundraising for a local cause. Conner’s Field was lit by both the stadium lights and a bright pinkish alpenglow as four of Tahoe’s most colorful D League coed softball teams sang the National Anthem, threw out the first pitch, and unveiled a custom-made trophy to kick off the first ever Fall Classic. The Gang, a North Tahoe volunteer club made up of hardworking, hard-playing locals who pitch in for local causes they care about, presented the event as a fundraiser for Pedal There. 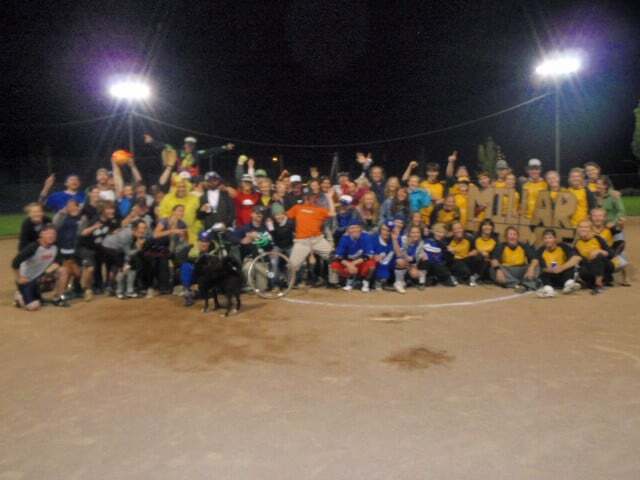 Most of the Fall Classic’s players were members of The Gang themselves, so inviting them to help a local cause by playing softball was something of a ‘no-brainer’! Rylan Cordova, Pedal There’s leader, is working to encourage Tahoe locals to bike, rather than drive, whenever possible. Among his early successes are a popular free bike valet service at the Tahoe City Farmer’s Market, and the placement of several new bike racks at local hotspots like restaurants and beaches. 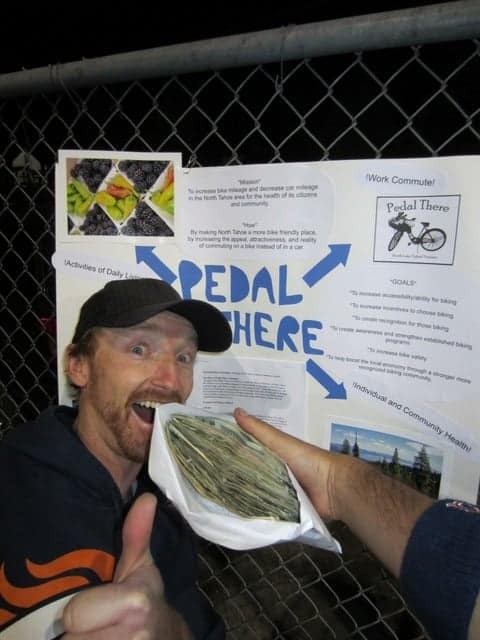 Thanks to generous contributions from Pete N Peters, several dozen spectators and 60 players, over $500 was raised for Pedal There to use however they see fit. Among the highlights of the night was the spirited announcing by a peanut gallery of amateur play-callers from each team, who used the PA system to announce the hobbies and habits of the hitters, follow the action on the field, and share dozens of inside jokes with their teammates. Two grills smoked all night and produced a lot of great bbq. The Gang and Pedal There each gained excited new members. Everyone enjoyed the late-summer night air and a chance to hang out with friends. As for the softball games themselves, D League champions Millar Time battled their way to win the championship game and the coveted trophy. Good times! The Tahoe Mountain Sports Adventure of the Week blog series takes a walk (or hike, surf, climb or home run) in someone else’s shoes, from pro athletes to local Tahoe adventurers. Let us know if you’ve got an adventure to share.